If you’ve spent time climbing peaks or wandering across the alpine tundra in Colorado, you’re probably familiar with the squeaky “Eeeep!” of the American pika. Hikers who spot pika are often charmed by these cute but bold relatives of rabbits and hares. Pikas are sensitive to climate-driven changes in temperature, snowpack and vegetation, and depend on healthy alpine ecosystems. Colorado’s climate is changing and researchers are concerned about the impacts this may have on American pika and their alpine habitat. The Front Range Pika Project (a partnership of Rocky Mountain Wild and Denver Zoo) engages citizen scientists in field research on American Pika in Colorado. This summer, FRPP and Walking Mountains Science Center are seeking volunteers to help the Forest Service determine the status of American pika on the White River National Forest and to improve the understanding of how climate change may impact pika and alpine ecosystems. To participate, volunteers must attend an introductory happy hour at Walking Mountains Science Center on Thursday, August 2nd from 5:30-7:00 pm. Volunteers will then sign up to conduct one or more pika field surveys with FRPP researchers, at sites in the White River National Forest, on specific dates between August 3rd and September 15th . Volunteers must be willing and able to hike at high altitudes. The minimum volunteer age is 12 (when accompanied by an adult). Pikas are as tough as they are cute. How do these pint size critters, who rely on plants for food, survive freezing winters in Colorado at elevations up to more than 14,000 feet? Pikas don’t hibernate or move to lower elevations in winter. Instead, they make their homes in crevices under fields of rock (called talus), where winter temperatures are warmer than at the surface thanks to snow that provides a thick layer of insulation from the cold. They also have warm coats and bodies that are efficient at burning fuel to keep warm. 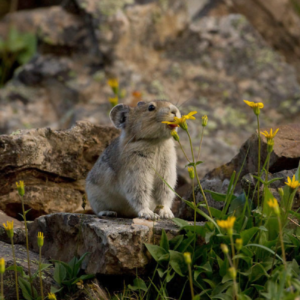 In summer, pikas are often spotted with a mouthful of wildflowers, as they industriously collect plants to store for winter in large “hay piles” under the rocks. Some of the traits that help pika survive winter make them vulnerable to overheating in summer. Prolonged exposure to temperatures above roughly 80°F can be lethal. Pikas avoid overheating by resting in the cool, shady crevices under the talus. One recent study predicts that pikas may disappear from Rocky Mountain National Park during this century under some climate change scenarios. Pikas have recently disappeared from parts of the Great Basin, California and southern Utah. Research is needed to determine whether pikas are declining in the White River National Forest and across Colorado. Studying pikas in the White River National Forest will also give land managers a better understanding of the health of the alpine ecosystems. If pikas are declining, that indicates that alpine ecosystems may be changing due to climate change or other human impacts. Volunteers will make an important contribution to conservation, learn about American pika and climate change and spend time enjoying Colorado’s high country. Space is limited, please RSVP to frpp@rockymountainwild.org by July 27th to register!